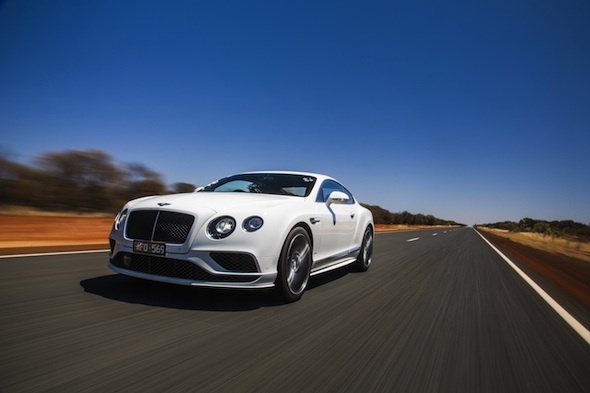 Bentley's Continental GT Speed has reached its top speed of 206mph in a run between Alice Springs and Barrow Creek on the Stuart Highway in Australia. Driven by Flying B Racing and Australian racing legend John Bowe, the GT Speed reached its 'VMax' in just over a minute, covering a football pitch or 92 metres per second at top speed. While at 'Vmax' the GT Speed circulates 216 litres of coolant through its engine and radiator per minute, along with taking in 4,700 litres of air each second. To overcome the aerodynamic loads, the engine had to use 80 per cent of its power. Fitted with a W12 6.0 litre twin-turbo engine, the Bentley covered 9.4 kilometres in the run, which took place on one of the few unrestricted roads in the world. Bowe, a six-time Australian touring car and two-time Bathurst 1000 champion, said, "This isn't a modified racecar, it's a luxurious grand touring road car fresh off the production line. "It took us a little over a minute to go from a standstill to 206 mph. That's extraordinary. Even when you break through the 200 mph barrier, the GT Speed just keeps accelerating." The Stuart Highway runs for 1,761 miles from Darwin in the Northern Territory to Port Augusta in south Australia – around the same as London to Istanbul. The local government announced a trial period of reverting to an open speed limit on the 120-mile section of road between Alice Springs and Barrow Creek back in 2013.